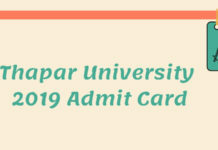 Thapar University Admission 2019 – The admission process for the academic session 2019 at Thapar University has started. The application form to apply for various UG, PG and PhD programmes are available at thapar.edu. Thapar University is a private university located in Patiala Punjab. The admission in the college is based on a national level entrance exam/university’s own entrance exam/basis of the class 12 marks. The candidates have to apply online to be able to take admission in the University. 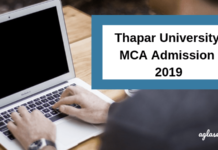 To check more details like fee structure, placements, application and admission process of Thapar University check the details below. 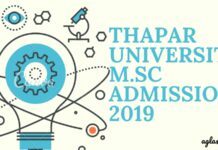 Latest: The application forms of Thapar University Admission 2019 are now available – Apply Here! Thapar Institute of Engineering and Technology also called Thapar University (TU), is among one of the best universities in the north-western region of India. Both UG and PG courses are offered by the University. The salient features of the programs offered by are semester-wise credit system, letter grades, continuous evaluation of the students’ performance, course-wise promotion and Choice Based Credit System (CBCS) which provides flexibility to allow the students to select courses and move at an optimum pace suited to their ability, capacity, and interest. The counselling of the candidates who are taking admission based on 10+2 merit is offline only and in person. The counselling for the candidates who are taking admission based on JEE Main 2019 Merit is online only. Step 1: Firstly, click on the “Apply Online” link on the official website of the home page of TIETU. The page will guide you to the landing page of the application form. Step 2: After reaching the landing page of the application form, students will have to choose the programme of their choice. It is advised to read the “Eligibility” section for the course they wish to apply. Also, go through the “How to Apply” section before applying for the respective programme. Step 3: Click on the link and fill in the details correctly. This tab will enable your account on the website. You would receive a unique “Username” and “Password” by email. Step 4: If you have already received your “Username” and “Password” you may log in with your “Username” and “Password” and fill in personal details like Personal Details, Academic Details, programmes of your choice, upload your recent photograph & signature (as per the prescribed format and size). After doing these, submit the application form. Step 5: Finally, pay the application fee through the Payment Gateway (online mode) or through Demand Draft (offline mode). For UG Courses: Passed in 10+2 or equivalent examination with a minimum of 60% marks in aggregate. For SC/ST candidates, it will be a minimum of 55% aggregate marks. Also, candidates must have acquired a minimum of 20% aggregate marks in the national level exam accepted by Thapar University for admissions to certain courses. For SC/ST candidates it will 15% aggregate marks in the national level exam. For PG Courses: Should have a Bachelor’s degree of minimum 3 years duration in any discipline from a recognized University. He/She should also have acquired a minimum of 60% (55% for SC/ST/Industry Sponsored) marks in aggregate in the qualifying examination, depending on the programme. Admission to all UG and PG programs will be on the basis of merit to be prepared by the University. In most cases, there are no separate tests conducted. However, for a few courses, the university shall conduct an offline exam. The admit card is also called hall ticket, which will be available whenever the official body will start issuing admit card before the commencement of the entrance examination. The entrance to all programs except BE/BTech, ME/MTech (programs offered by BTD, CHED, EIED, SEE and SPMS), MA and MSc, MCA shall be conducted online. In the admit card, candidates need to paste the latest passport size photograph. After registration, you will need to take two printouts of the admit card and paste photograph on each. It is important that the examinee should bring their admit card/ hall ticket to appear for the examination. The admit will contain details of the date and time of the test and venue of the examination center. Note: One copy of the admit card shall be retained by the entrance test center. Thapar University will release the qualified candidates’ list as a result of various courses. Candidates can check it from the official website or through the direct link provided on this page for the sake of candidates. The qualified candidates will proceed for the further admission process in Thapar University in their intended courses. Thapar University offers Undergraduate and Postgraduate admissions to international students as well. Around 15% over and above seats in each program shall be reserved for the Foreign Nationals/ Non-Resident Indian candidates. These students would not have to appear in the Entrance Test (except for Ph.D. program). Demand Draft of fee in favour of the Thapar University, payable at Patiala. The original passport & photocopies of pages containing personal Information and Visa. Documentary proof showing the location of the school/Institute where the student is currently doing the qualifying exam. I am a mediocre student.How do I get into the Thapar Institute Of Engineering and Technology campus in 2019 what is the admission procedure? Wow. I am really impressed by the video and the details you have put up. I am putting my 100% in my boards examinations, do I still need to give JEE to get admission in Thapar Institute? Well that is so good to hear that you are preparing your best for the exams and Thapar University has different entrance exam so you need to appear for it.